KUALA LUMPUR -- Malaysia is considering pulling out of a soccer tournament co-hosted by Myanmar in protest at its crackdown on ethnic Rohingya Muslims, a senior Malaysian official said on Wednesday, risking a possible global ban by the sport's governing body, FIFA. 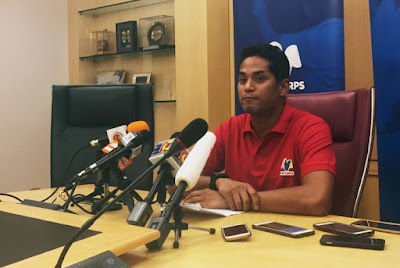 A withdrawal by Muslim-majority Malaysia from the ASEAN Football Federation's (AFF) Suzuki Cup, which began on Saturday, would run counter to the 10-member Association of Southeast Asian Nations' long-standing policy of non-interference in other members' affairs. Malaysian Youth and Sports Minister Khairy Jamaluddin said he raised the issue last week, but a decision would only be made at a cabinet meeting on Friday. "While we've known for a while that Myanmar will be the host, this (decision) is based on recent reports from the Rakhine that showed proof of attacks, that reportedly show evidence of genocide," Khairy told reporters. "But whatever they decide, we must continue to speak up," he added. Malaysia lost 1-0 to Vietnam on Wednesday but can still advance to the semi-finals. It faces Myanmar on Saturday in its last group game. The conflict in Myanmar's northwestern state of Rakhine has sent hundreds of Rohingya Muslims fleeing to Bangladesh and poses a serious challenge to Nobel Peace Prize winner Aung San Suu Kyi, who swept to power last year on promises of national reconciliation. A Malaysian Islamic cleric had earlier called for Malaysia to pull out of the tournament, which is co-hosted by the Philippines. A Myanmar presidential spokesman was not immediately available for comment. The AFF Suzuki Cup features some of the world's lowest-ranking sides and would mean little in terms of boosting global rankings among the participating sides, but fierce local rivalries and football's popularity make the event king in the region. Worse than facing the wrath of angry fans, however, is the real possibility of sanctions by FIFA should Malaysia decide to pull out of the tournament. FIFA statutes dictate that members must remain neutral in politics and religion, avoid all forms of discrimination and be independent and avoid any form of political interference. A breach of FIFA statutes could lead to a complete soccer ban for a country, or even an expulsion from the global organization in the event of a serious violation. A spokesman for FIFA in Zurich told Reuters it was observing the Malaysia situation and that it couldn't comment further. Indonesia was previously handed a FIFA ban for government interference in the running of its football association. The almost one-year ban was lifted in May. Wednesday's developments sparked debate in social media with more Malaysian leaders calling for the team to return. "In 1980, we withdrew from the Olympic Games that is more prestigious to protest the invasion of Soviet troops on Afghanistan," opposition leader Nurul Izzah Anwar said in a statement. Myanmar soldiers have poured into the Maungdaw area of Rakhine since Oct. 9, after an insurgent group of Rohingya that the government believes has links to Islamists overseas launched attacks on several border guard posts. At a closed-door UN Security Council meeting in New York last week, representatives from Malaysia raised concerns that the situation in Rakhine state could "trigger new movement of population across borders to neighboring countries". They said Malaysia “was already hosting within its borders more than 100,000 people from the Rohingya community", according to two diplomats familiar with the discussions. Some 25,000 Rohingya and economic migrants from Bangladesh boarded smugglers' boats between January and March 2015, almost double the number over the same period in 2014. An estimated 300 people died at sea as a result of starvation, dehydration and abuse by boat crews.